Used cars for the lowest prices !!! All Cars In Excellent Condition !!! We are owned & managed by a swiss mechanic. Can we say any more than this? If your tired of the "Normal" service you might find, example: greasy hand prints all over your car, tools forgotten in your air filter and the usual "I Don't Care" Attitude, then come to us because we care about the work we do & the cars we sell.Word of mouth is our best advertisement ! excellent condition, velour seats, Radio tape, alloy wheels, etc. white, all original, excellent condition, 7 liter V8 engine (429 cubic inches). automatic, electric seats, electric windows, Sony Stereo Sound System, org. wheels, new tires, (from USA), new double exhaust system, mufflers (deep sound), org. full tail light bar, etc. This is a real classic American Car, powerful and luxury, in this car you don't drive, you fly on the road. 4 door limousine, excellent condition year 1989, silver metallic, interior black leather. Sony Sound, el. windows, etc. 45 000 km, excellent condition (OPEL TECHNOLOGY) california red color, electric windows, electric .mirrors, central. lock, power steering, Sound System, alloy wheels, org spoiler kit. 60 days service guarantee!!! 43 000 km, excellent condition (OPEL TECHNOLOGY) color: yellow, velour seats, electric. windows, Stereo System. etc. 1996 and 1998, excellent cond. power steering, velour interior, Radio tape, etc. red, automatic, 4 door, good condition, velour interior, spoilers central. lock, Radio tape, alloy wheels, etc. 60 days guarantee!!! automatic, 5 door, excellent condition, color: sky blue metallic, velour interior, Radio tape, 4 speakers, electric. windows, central lock, power steering, 45,000 km Service booked. 60 days guarantee. full options, best condition 75 000 km, leather interior, roof rack, alloy wheels etc. only one owner, absolutely nice and clean, no off road driven. org 6.6 liter V8 excellent condition, color: yellow / black / T- Roof, original eagle, Alloy wheels, Sound System, org. Spoiler Kit, 4 barrel carb. double exhaust system (deep sound) This is a real sports car, enough power!!! yellow, 3 door, good driving condition. 1.8 liter engine, manual gear electric windows. 2 liter engine, excellent condition, blue metallic, 5 speed, full options velour interior, alloy wheels etc. Model 1994 und 1996, color white and blue metallic, both in excellent condition 2 liter engine, (Opel Technology). 2.8litre Turbo diesel engine, automatic, full options, alloy wheels, etc. 4 door, withe, many options, velour interior. safari bumpers, power steering, Radio tape, etc. excellent condition, power steering, tinted windows, etc. Radio tape, etc. We get all spare parts for you, also for US Cars, within 3 days. INTERCAR has their own Import Service!!! So, don't worry about!!! - Daily delivery service from Bangkok! All vehicles we delivery with a 60 days Service guarantee. We sale only TOP QUALITY CARS!!! 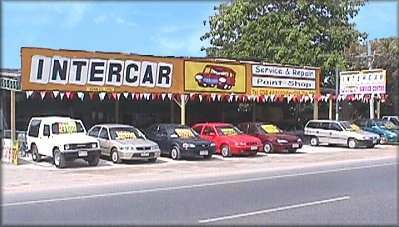 All cars are approved by our own Service Center!!! Spare Parts: We can get all kinds of spare parts for you, also for US Cars, within 3 days. INTERCAR has their own Import Service!!! So, don't worry about it!!! All kinds of repair, electric installations, body and professional paint works, installation of alarm and sound systems, repair of automatic transmissions, mechanical service and diagnostic, etc. We specialize in repairing Mercedes Benz, BMW, Porsche and US Cars!!! Note: All prices as of March 1st 2000 and may change without notice. Now at new location ! Located on sukhumvit highway between central & north roads.